Journal of Educational Policy and Entrepreneurial Research is a monthly double blind peer review open access Journal. It is now published by International Education and Leadership Research Team. 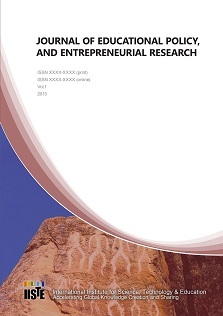 It publishes ORIGINAL research papers in areas of education and entrepreneurship. The objectives are to provide solutions to problems of education and entrepreneurship through publication of findings from researches and reviews of policies. JEPER also aims at establishing effective communication channel between decision and policy makers in educational and research institutions as well as government agencies. Papers submitted to the Journal are subjected to double blind peer review and authors must make corrections as regards to the review comments before the paper is published in JEPER. Review Process Policy: Papers submitted to JEPER Journal will go through double blind review and the outcome will be communicated to authors sometimes within three weeks. Note that we do not use paper preparation template. Papers are sent to experts for reviews, sometime papers are sent to people who are not editorial board member of the Journal for review. This is to ensure quality and to ensure that papers are reviewed by experts in a particular field of Education or Entrepreneurship. If there are suggestions or comments made on submitted paper(s), authors MUST make corrections and changes before we can publish such paper in our next issue. Although, authors have rights to sometimes argue with the reviewers or question the reviewer’s suggestions; this is to enable them arrive at a conclusion and to make the paper come out fine. Authors are strongly advised to ensure that all citations in their manuscripts are well referenced and all references are as well properly cited in the paper. For research papers, we encourage you to state clearly your problem statements which called for the study conducted; ensure to have specific purposes and research questions that guided the study. Have a good introduction and conclusion as well as recommendations. Authors are advised to use the Latest APA citation and Referencing styles when preparing their manuscripts for submission. APA formats can be downloaded freely online. Use 12 font size, Times New Roman. After reviews of submitted papers, authors are encouraged to study the review comments and strictly follow the suggestions, corrections and new ideas gave to ensure they are well effected in the paper before submitting such paper finally for publication. Please note that we MUST also do our own editorial work as well to ensure that typographical errors, errors in English language, incomplete sentences etc. are well corrected. Acceptance/Rejection Notification: Authors are notified of the journal decision after a thorough review works are done on their papers. Sometimes, the review outcomes may suggest as follows: Publish if the Author makes the suggested corrections as outlined in the paper; Reject, the paper is not in line with the scope of the Journal; Reject, this paper is not publishable. Publication Fee: We try as much as possible to be very transparent in Article processing Fees. If a paper is accepted for publication in Journal of Educational policy and Entrepreneurial Research, author(s) will be asked to pay a publication fee of $100 USD as article publication fee in order to defray the operating costs. This fee covers online publication + one hard copy of the Journal sent to the author’s physical address despite the destination. If a paper is prepared by more than one Author, the second, third or fourth author can get their hard copies of the Journal at cost of US$20 each. The additional fee is to cover the cost of hard copy printing and postal services. Paper Withdrawal Policy: Once an author submits a paper, they are very free to withdraw their papers at any time before such paper is published at no cost. And JEPER cannot publish a paper unless the author authorizes JEPER through signing Author copyright form and pay the publication fee. Many authors have withdrawn their papers after review comments are sent to them (Maybe some authors are unable to cope with the suggestions outlined in their papers) and we humbly grant them their wishes! We do not keep authors’ intellectual properties with us. Once papers stay more than two months with us, we contact the authors and delete such papers. This is to enable them send such paper to other Journals they may wish to in case they do not want to continue the publication with JEPER. Dr. Santosh Kumar Behera, Assistant Professor, Department of Education, Sidho-Kanho-Birsha University, Purulia, West Bengal, India. Dr. Simin Ghavifekr, University of Malaya, Malaysia. Dr. Dickson Nkonge Kagema Department of Arts and Humanities, Chuka University, Kenya. Journal of Educational Policy and Entrepreneurial Research (JEPER) is a high quality double blind peer review open access Journal that aim at publishing high quality research papers in all areas of educational policies and management, entrepreneurship development and related researches. The Journal welcomes submission of manuscripts that meet the general scope and criteria of JEPERpublication. Articles can be submitted in the following areas of interest: Adult Education, Agricultural Education, Art Education, Business Education, Community Education, Computer Education, Cross-disciplinary areas of Education, Curriculum, Research and Development, Distance Education, Economics of Education, Education and child Labour, Education Policy and Leadership, Educational Administration, Entrepreneurship Education, Entrepreneurial skills, Entrepreneurship and Youth Empowerment, Educational Foundations, Educational Measurement and Evaluation, Educational Psychology, Educational Technology, E-Learning, Elementary Education, Environmental Education, Geography Education, Guidance and Counseling, Competitive Skills, Continuing Education, Health Education, Higher Education, Technology in Education, Measurement and Evaluation in Education Home Economics Education, Human Kinetics, Human Resource Development, Human Rights Education, Indigenous Education, Innovations and Change, International Education, Language Education, Mathematics Education, Music Education, Non-Formal Education, Population Education, Pre-Primary Education, Reading Education, Religion Studies, Science Education, Secondary Education, Composition of entrepreneurial activity, Social Studies Education, Special Education, Student Affairs, Teacher Education, Technical Education, Visualization skills, Vocational Education, Women Education/Gender, Industrial Cooperation, Life-long Learning Experiences etc. the journal also welcomes other articles within the scope of Education policies and entrepreneurship development etc. Otor, E. E.,	Omenka, J.E. Owede, Kosioma E,	Mbadiwe-Woko, E. F.